The BBC television presenters Mike Smith and Sarah Greene have been seriously injured in a helicopter crash in Gloucestershire. Miss Greene broke both her legs and an arm when the helicopter her partner was piloting smashed into trees close to where he was attempting to land. Mr Smith - who bought the two-seater craft after learning to fly in February - suffered a broken back and ankle. Both have been taken to a local hospital and are said to be in a satisfactory condition. It is not yet known what caused the accident, but witnesses said it sounded as if the helicopter had experienced a sudden loss of power before it hit the trees. Maggie McMillan - whose husband helped pull the couple from the wreckage - said the accident happened very quickly. "We were watching it arrive - the plane circled and the next moment it fell and we heard a crash. "My husband and Mr Bock helped to take Sarah and Mike from the actual aircraft - but they were conscious," she said. 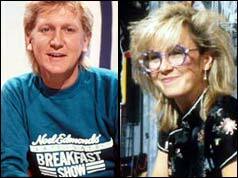 The two BBC presenters had been on their way to visit friends near Cheltenham. The Civil Aviation Authority has launched an investigation. Both the presenters were in hospital for about four weeks after the accident, but Sarah Greene went back to presenting the Saturday morning children's show Going Live before she was out of plaster. The couple became engaged soon after the crash and were married a year later. Mike Smith was cleared of blame after the investigation and continued to fly.